I've heard of the Aurora Teagarden series for years. Years ago I picked one up at my town library, flipped through it, and put it back on the shelf. Then I discovered her Sookie Stackhouse urban fantasy series and the first 5 or 6 were wonderful. Along the way, I read her Harper Connelly mysteries. 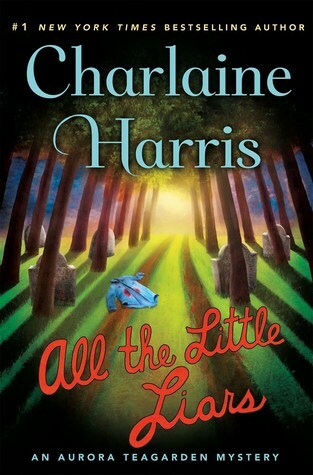 Then back in the fall, I was offered "All the Little Liars" for review. I was intrigued, wanting to try this series again, but also hesitant to start with book 9. The publicist assured me it was a good jumping in point for new readers since it had been so many years since the last book and 'Aurora starts off with new marriage and a new way of solving the mystery.' So I said yes. The book didn't grab me right off; I actually put it down and walked away from it for several months. The beginning is a lot of set-up and catching the reader up. On the one hand, that was good for me since I was clueless, not having read the series before. But on the other hand, it dragged the story down right when it should have been grabbing the reader's attention. The story finally picked up when the children, including Aurora's brother Phillip, go missing. It picks up steam from there as Aurora tries to figure out what happened to her brother and the others. There's a lot of family drama involving Phillip and Aurora's father, and there's drama around a couple of the missing children. Harris tackles the subject of bullying and touches on the added dimension that the Internet has given to bullying. There were some other slow parts to the story, not just the beginning, and a fair amount of unnecessary detail concerning food and clothing. The mystery was entertaining and had some surprises. The relationship between Aurora and her new husband Robin was sweet and I enjoyed seeing them so happy together even though I hadn't read any of the previous books. Overall, it ended up being a good story, despite the pacing and extraneous details and I'll give this series another try. Hmmm..I haven't read this author but have been curious about this series after watching the Hallmark movies. Have you seen any of them? I haven't. I don't have cable. Once the story engaged me, I liked it, but it was a bumpy start. I really enjoyed this but I have read all the other books so I think I was more invested going in because these were characters I really felt like I knew. I agree about liking how the author handled the bullying - especially in regards to the internet. It wasn't heavy handed but it wasn't glossing over either. It worked as a stand alone but I think I would have enjoyed it more with a prior investment.